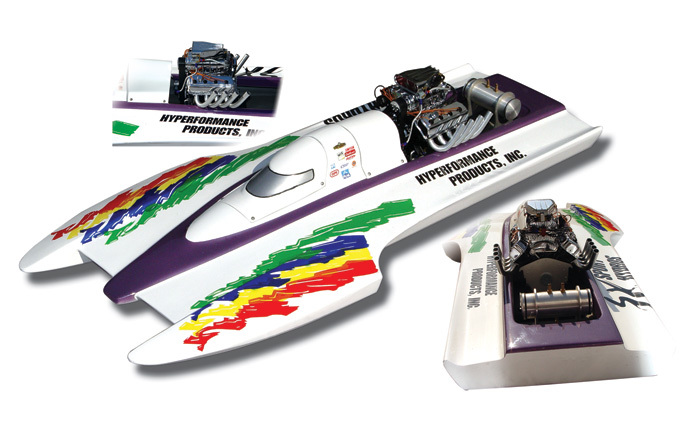 These Drag Hydros are sure to get your heart pumping! Hulls are made of hand-laid epoxy/fiberglass and white-primered in the mold. Simple sanding of the seams and surfaces, installation of radio components, hardware, and motor, and you are ready to take on the Drag Competition! Install a 45, 67, or 90 motor for High-Performance Racing! For complete authenticity, include our "V"-Drive and spun aluminum fuel tank. Approx. Hull Weight (Bare): 3lbs. (Shown with optional, static Blown Hemi. Blown Fords also available).